Chaitén (Chile). Based on web camera views and analyses of satellite imagery, the Buenos Aires VAAC reported that on 14 October an ash plume from Chaitén’s lava-dome complex rose to an altitude of 2.1 km (7,000 ft) a.s.l. and drifted 150 km NNE. A diffuse plume was seen the next day drifting 15 km SW at the same altitude as the previous day. During 15-16 October, a thermal anomaly was seen. On 18 October, a possible plume drifted 50 km SE at an altitude of 2.1 km (7,000 ft) a.s.l. Diffuse ash plumes possibly mixed with steam and gas rose to an altitude of 1.8 km (6,000 ft) a.s.l. on 20 October and drifted NE and SE. Ebeko (Russia). Based on analyses of satellite imagery, the Tokyo VAAC reported that on 15 October a possible eruption plume from Ebeko rose to an altitude of 10.7 km (35,000 ft) a.s.l. and drifted NE. Gaua (Vanuatu). On 13 October, Vanuatu Geohazards Observatory confirmed that Gaua’s Mount Garat was erupting based on fieldwork done by scientists during 3-7 October. Seismic records showed multiple explosions, and a gas flux measurement of 3,000 metric tons of sulfur dioxide was detected on 3 October. The Alert Level was raised to 2 (on a scale of 0-5). Kaba (Indonesia). On 20 October, CVGHM reported that seismic activity from Kaba increased in August and remained elevated in September and October. Inflation was also detected. When weather permitted, diffuse white plumes were seen rising 25-50 m above the crater rim and drifting E. Based on the deformation and increased seismicity, CVGHN raised the Alert Level to 2 (on a scale of 1-4). Kizimen (Russia). KVERT reported that seismicity from Kizimen was above background levels during 8-11 October and at background levels during 12-16 October. A weak thermal anomaly was seen at the volcano in satellite imagery on 9 October. The Level of Concern Color Code remained at Yellow. Kliuchevskoi (Russia). KVERT reported that during 9-16 October seismic activity from Kliuchevskoi was above background levels and weak tremor was detected. Satellite imagery revealed a daily thermal anomaly at the volcano. On 11 October, Strombolian activity ejected tephra 200 m above the crater. Fumarolic plumes containing small amounts of ash rose to an altitude of 5.7 km (19,700 ft) a.s.l. The Level of Concern Color Code remained at Orange. Nevado del Huila (Colombia). Based on web camera views, INGEOMINAS reported that on 16 October an ash plume from Nevado del Huila rose 1 km and drifted E. Ashfall and sulfur odors were reported in several surrounding areas. Later that day, seismicity increased, prompting INGEOMINAS to raise the Alert Level to II (Orange; “probable eruption in term of days or weeks”). deformation and rockfalls continued to be detected. On 18 October, another seismic crisis was noted along with deformation on the N and S sides of Dolomieu crater. Aerial observations on 19 October revealed a small new fumarole in the crater. Changes in the chemical composition of the gases were also noted. A greater number and duration of rockfalls than in previous days was detected on 20 October. Reventador (Ecuador). The IG reported that field observations of Reventador on 16 and 17 September confirmed the presence of a lava flow on the S flank of the cone. Gas and steam emissions were noted, as was growth of the lava dome. Thermal anomalies over the crater area were detected in satellite imagery on 6, 11, and 13 October. On 14 October, seismicity increased and harmonic tremor was detected. A seismic station on the NE flank of the cone detected rockfalls. Several people living in the area reported roaring noises and observed slight incandescence from the crater during the previous few nights. During an overflight on 16 October, scientists saw the lava dome and a lava flow on the N flank. Bluish gases were emitted. According to a thermal camera, the incandescent parts in the crater were about 300 degrees Celsius. Other observers heard roaring noises and sounds resembling “cannon shots.” Incandescent blocks were ejected from the crater, and steam and gases rose 100 m and drifted SW. Incandescent material was seen on the S flank. On 17 October, incandescence on the S flank was seen and noises similar the previous day were again heard. A small gray plume was seen the next day. On 19 October, thermal anomalies were again detected on satellite imagery. During an overflight, blue gas plumes were seen. The lava flow on the S flank occupied a large area and was divided into two branches. Soufrière Hills (Montserrat). MVO reported that during 9-16 October activity from the Soufrière Hills lava dome was at a high level; a new lava dome first reported on 9 October continued to grow. Over 1,200 rockfalls were detected by the seismic network. Pyroclastic flows traveled down every major drainage valley except the Tar River valley to the E. Brief views of the lava dome revealed that the new lava dome summit was about 60 m above the old dome structure. Heavy rainfall caused a lahar in the Belham Valley to the NW on 14 October. On 16 October, several large pyroclastic flows descended the White River to the S and reached the sea. Moderate-sized pyroclastic flows traveled 3 km NE down Tuitts Ghaut and White Bottom Ghaut, and a few smaller pyroclastic flows descended Tyers Ghaut to the N. Extensive ash clouds rose to an altitude of km (20,000 ft) a.s.l. and drifted WNW, resulting in minor ashfall in inhabited areas. During 18-19 October, rockfalls and small pyroclastic flows continued to be detected. Bagana (Papua New Guinea). Based on analyses of satellite imagery, the Darwin VAAC reported that on 15 October an ash plume from Bagana rose to an altitude of 2.1 km (7,000 ft) a.s.l. and drifted 55 km SW.
Batu Tara (Indonesia). Based on analyses of satellite imagery, the Darwin VAAC reported that during 14-16 October ash plumes from Batu Tara were seen drifting 25-185 km W and N at an altitude of 1.8 km (6,000 ft) a.s.l. Cleveland (Alaska, USA). 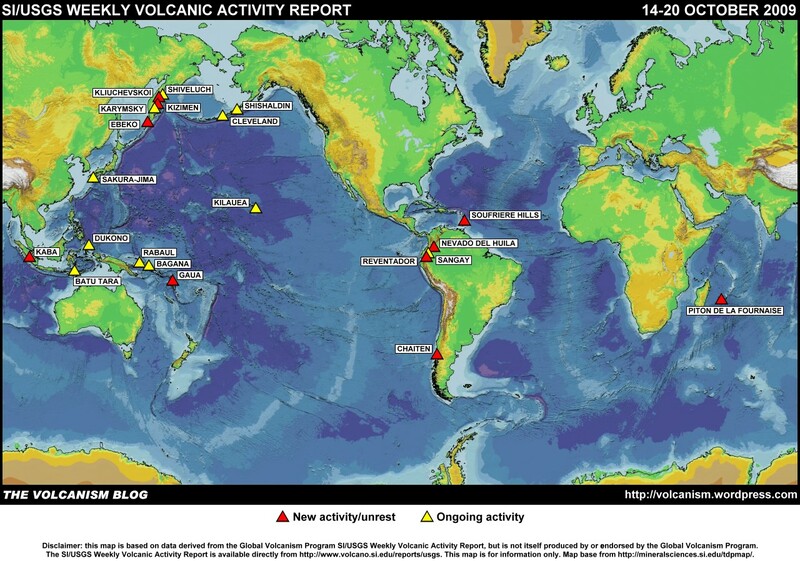 On 19 October, AVO reported that no eruptive activity from Cleveland had been observed since the brief eruption on 2 October. The Aviation Color Code and the Volcano Alert Level were lowered to Unassigned. Cleveland is not monitored by a real-time seismic network, thus the levels “Green” or “Normal” do not apply because background activity is not defined. Dukono (Indonesia). Based on analyses of satellite imagery, the Darwin VAAC reported that on 15 October an ash plume from Dukono rose to an altitude of 2.4 km (8,000 ft) a.s.l. and drifted 45 km NW. Karymsky (Russia). KVERT reported that seismic activity at Karymsky was elevated above background levels during 9-16 October and possibly indicated that ash plumes rose to an altitude of 3.7 km (12,100 ft) a.s.l. On 12 October, volcanologists doing fieldwork saw an ash plume rise to an altitude of 3.5 km (11,500 ft) a.s.l. The Level of Concern Color Code remained at Orange. Based on information from KEMSD, the Tokyo VAAC reported that on 20 October eruptions produced plumes that rose to altitudes of 3-3.7 km (10,000-12,000 ft) a.s.l. Ash was not identified on satellite imagery. Kilauea (Hawaii, USA). During 14-20 October, HVO reported that lava flowed SE from underneath Kilauea’s Thanksgiving Eve Breakout (TEB) and rootless shield complex through a lava tube system, reaching the Waikupanaha ocean entry. Thermal anomalies detected in satellite images and visual observations revealed active surface lava flows on top and at the base of the pali. Intermittent incandescence was seen from the Pu’u ‘O’o crater floor and an East wall vent. The vent in Halema’uma’u crater continued to produce a diffuse white plume that drifted SW. Fresh Pele’s Hair was collected near the summit on 16 October. Incandescence originated from sources inside the vent cavity; on 18 October a lava pond surface was seen, but then disappeared. Preliminary measurements indicated that the sulfur dioxide emission rate at the summit remained elevated; 690-940 tonnes per day was measured during 16-18 October. The 2003-2007 average rate was 140 tonnes per day. Rabaul (Papua New Guinea). Based on analyses of satellite imagery, the Darwin VAAC reported that on 15, 18, and 20 October ash plumes from Rabaul caldera’s Tavurvur cone rose to altitudes of 2.7-3 km (9,000-10,000 ft) a.s.l. and drifted 25-85 km NW, W, and NE. altitude of 2.4 km (8,000 ft) a.s.l. and drifted SE. Sangay (Ecuador). Based on analyses of satellite imagery, the Washington VAAC reported that on 15 October a small plume from Sangay drifted 15 km SW.
Shishaldin (Alaska, USA). On 19 October, AVO reported that recent clear satellite views of Shishaldin showed no activity; the last thermal anomaly was detected on 16 August. Seismicity was variable, but within background levels. The Aviation Color Code was lowered to Green and the Volcano Alert Level was lowered to Normal. Shiveluch (Russia). KVERT reported that during 9-16 October seismic activity from Shiveluch was above background levels and possibly indicated that ash plumes rose to an altitude of 4.5 km (14,800 ft) a.s.l. Analyses of satellite imagery revealed a large thermal anomaly over the lava dome during 8-13 and 15 October. Fumarolic plumes containing small amounts of ash rose to an altitude of 3.5 km (11,500 ft) a.s.l. during 11-13 October. According to video camera data and visual observations, multiple hot avalanches traveled down the lava dome on 12, 13, and 14 October, and deposits from a small pyroclastic flow on the SE flank were noted. The Level of Concern Color Code remained at Orange. 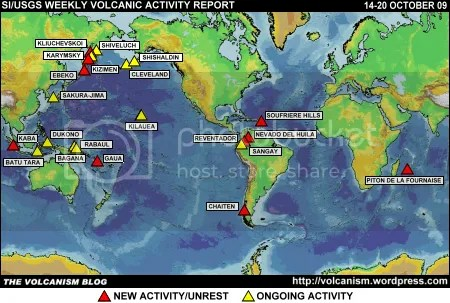 The foregoing is a summary of the Smithsonian Institution/United States Geological Survey Weekly Volcanic Activity Report covering 14-20 October 2009. It is provided for information only, and is based on but not a substitute for the full report, which comes with its own criteria and disclaimers. The map base is derived from the Smithsonian Institution/USGS/US Naval Research Laboratory This Dynamic Planet website. Unless there is a new category of wandering volvanoes, I suggest that Bagana is actually located in Papua New Guinea not Indonesia. Whoops! Thanks, Paul – fixed.